Schermoly finds it helpful for dancers to cross-relate music styles. Whether teaching a contemporary ballet workshop or choreography from her repertory, she has students identify the time signature from a Michael Jackson song or a Glenn Miller jazz piece, then compare it to a classical orchestration. "Sometimes classically trained ballet dancers get stuck in a box," she says. "So we talk a lot about musicality and how it affects movement." When teaching a ballet class, though, Schermoly rarely strays from the traditional structure. "There's so much to learn from classical music and the many styles within ballet," she says. "I would rather talk about speed and rhythm within the classical framework." Song: "The Way You Make Me Feel"
"When I was a child, my mother, who was an Olympic artistic gymnast, used to play this song as a warm-up in our gymnastics group. She coached me for a short time before I moved on to rhythmic gymnastics. This song is nostalgic and makes for a good, upbeat start on days even when energy is low. It's a good pick-me-up." "I enjoy the change of mood in this and the dreamy quality of that era. It's a feel-good song that seems to enhance smooth, grounded movement." "This song's repetitiveness is good to build longer combinations. It also allows for both fast-paced, staccato movement and longer, sustained adagios. 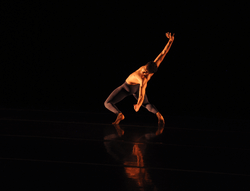 Often a class favorite, it's emotive and dancers connect to its pensive, pulsating rhythm." Song: "Give Me One Reason"
"This song gets me every time. It spikes my flow, and I enjoy its funky downbeat." "The entire album, any day forever and ever, amen."